Asia’s largest annual multinational military exercise kicks off. On Tuesday, the United States and Thailand kicked off the 2016 iteration of the annual Cobra Gold military exercises – Asia’s largest multinational drill – amid lingering concerns by Washington about its ally’s democratic future. Royal Thai Army Supreme Commander, General Sommai Kaotira, and U.S. Ambassador to Thailand, Glyn Davies, launched the 35th iteration of the annual exercise – which began as a bilateral drill between Washington and Bangkok – at the Royal Thai Navy Command Center in Sattahip district in Chonburi province. 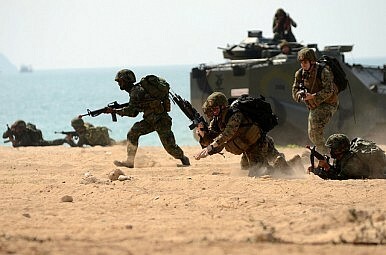 According to a statement by the Thai government, this year 8,564 personnel from seven nations – United States, Thailand, Indonesia, Japan, Malaysia, Singapore and South Korea – are participating in the exercise, with a further 21 nations participating in reduced roles as is customary. Nine other countries participated in multinational planning while nine others sent observers. As I have written previously, since a May 2014 coup in Thailand, the United States has been attempting to balance both signaling its disapproval at the coup while also preserving defense engagements critical to its alliance with Thailand as well as its commitment to the Asia-Pacific more generally (See: “Exclusive: Managing the Strained US-Thailand Alliance”). With respect to Cobra Gold, after much deliberation the Obama administration decided to continue a scaled down U.S. involvement in the 2016 military drill (See: “Confirmed: US Will Hold 2016 Cobra Gold Military Exercises in Thailand”). Some 3,600 U.S. troops are in Thailand for the 11-day exercises, a similar number to last year. At the same time, Washington continues to call for the holding of elections in Thailand and the full restoration to democratic governance. Since the junta assumed power following the coup, polls have repeatedly been delayed, first into 2016 and now into mid-2017 (See: “Thailand’s Junta Chief Pledges New Elections in 2017”). At his address during the opening ceremony of Cobra Gold 2016, Davies, the U.S. envoy, once again underscored the point that the U.S.-Thailand alliance would reach its full potential only when this occurs. “As deep and broad as our partnership is today, it will grow stronger still when, as the prime minister has affirmed, Thailand returns to elected governance. With a strengthened, sustainable democratic system, Thailand’s regional leadership role, and our alliance, can reach its full potential,” Davies said. A look at ongoing efforts to manage Washington’s oldest Asian alliance. US, Thailand Resume Strategic Dialogue in Boost for Strained AllianceUS Urges Thailand to Restore Democracy, Respect RightsUS, Thailand Launch Naval Exercise in Andaman Sea US Envoy to Thailand Under Lese Majeste ProbeWhat's Next for US-Thailand Military Ties?